The Display can show your delay time (in milliseconds or beats per minute) or your preset bank number. When editing a sound it will display your delay parameters. Value gives you complete control over delay parameters, global settings, and fine-tuning of delay time. Each Delay Machine type has it's own set of easily tweakable delay parameters. Time controls the delay time according to the Delay Machine type. The full range of the Time knob varies depending on the Delay Machine you select. Set to zero to hear one repeat. Set to 100% and hear sustained infinite repeats and the accompanying regenerating oscillation. Type allows you to select your Delay Machine type. Choose from Digital to Tape and everything in between. Press to toggle the display between Bank and Time. Press and hold to save a preset. Filter controls the shape of the repeats filter. In the dTape machine this controls Tape Age, and in the dBucket machine it controls the lowpass filter cutoff frequency. In the Filter machine, it controls the center frequency of the LFO filter. Grit is a lo-fi process that progressively adds distortion and other artifacts. In the dBucket machine this controls Bucket Loss, and in the dTape machine it controls Tape Bias. Mod Speed controls the speed of the delay modulation LFO. In the dTape machine this controls Tape Crinkle. Mod Depth controls the intensity of the delay modulation. In the dTape machine this controls Wow & Flutter. A Footswitch activates or bypasses your preset. Press and hold for infinite repeats. Press A and B simultaneously to Bank Down through your presets. In Looper mode, this switch activates Record and Overdub. B Footswitch activates or bypasses your preset. Press and hold for infinite repeats. Press B and TAP simultaneously to Bank Up through your presets. in Looper mode, this switch activates Play. Tap Footswitch allows you to Tap in your tempos. Press and hold to enter and exit Looper mode. In Looper mode, this switch activates Stop. Left Input - Plug your instrument in here. Acts as a mono input when only one channel is being used. Right Input - Plug your instrument in here. Acts as the Feedback Loop Return when Feedback Loop switch is activated. Left Output - Connect to your amp, mixing board, etc. Acts as a mono output when only one channel is being used. Right Output - Connect to your amp, mixing board, etc. Acts as the Feedback Loop Send when Feedback Loop switch is activated. Expression Pedal Input - Connect to an expression pedal and control any knob or combination of knobs. Can also be used for an external tap switch. Feedback Loop Switch - allows connecting an external effect in the delay feedback path. MIDI Input - Connect to external MIDI controllers. 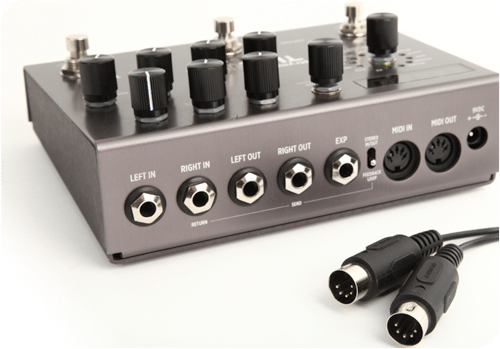 MIDI Output - MIDI CCs can be sent out of the MIDI output whenever a knob is turned or a switch is pressed. Power - 9VDC (center negative), 300mA minimum. Presets, Expression Pedal Control, Stereo Looper, Feedback Loop, and MIDI Integration. While the TimeLine is an amazing tool in live contexts, many players will find it incredibly expressive in the studio, too. In addition to the deep functionality of the unit at the most immediately accessible levels, each delay machine can seem almost infinitely tweakable to suit a musical situation. TimeLine’s variety and quality of sounds, solid construction, and ease of use— all at a reasonable price point—more than qualiﬁes it for an Editors’ Pick Award. We reckon that a comprehensive range of delay effects that is particularly strong on emulating vintage gear, plus myriad tweakable parameters to create your sounds and 200 memories so you won’t lose any of them, is a killer combination. The TimeLine is the best delay pedal I’ve ever used. TimeLine is the ultimate delay pedal, whether you’re into modern sounds, vintage ones, or a modern take on vintage ones. 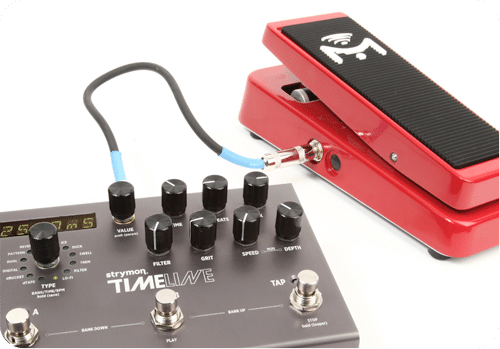 TimeLine offers a level of simplicity and incredible depth that few pedals can even come close to matching. 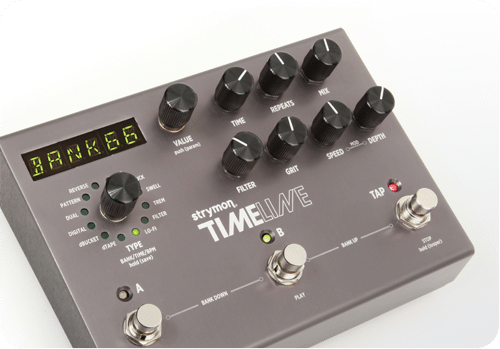 If I could only own one delay pedal, the Strymon TimeLine would be my first choice without hesitation. I can’t believe how much detail was included in the design of this pedal and its precious algorithms. Each one has elements that I’m just in love with. The Strymon TimeLine is the best all-around delay effects pedal I’ve had the pleasure of playing. With sounds ranging from luscious tape echo and warm analog delay to pristine digital delay and otherworldly rhythmic ambience, all of the TimeLine’s delay machines are beautiful to behold.